I like furniture! Scrappy the Corgi / Shepherd mix. 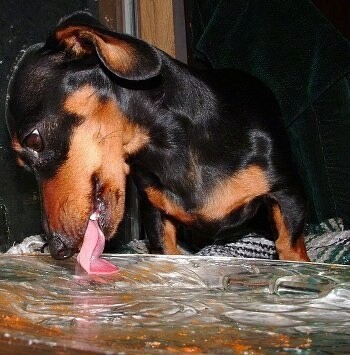 "Gracey, our 4-year-old, seven-pound Dachshund. 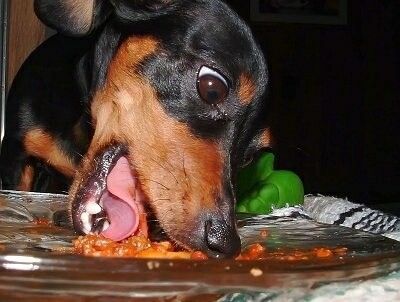 Swas caught in the act of finishing off her dad's plate of spaghetti. This is her FAVORITE food so she could NOT resist. Did we scold her? NEVER!" Mojo the Pomeranian caught getting into the garbage bag! The evidence is all over his face! Mojo the Pomeranian caught disturbing Lily the rat! Charlie Grrrl when she was 16 months old. She found a tube of oil paint. Luckily, it wasn't toxic. Her owners used Crisco oil and Palmolive dish soap to clean her up. She's a Wire-Haired Fox Terrier.